We all know that Baby powder is essential in a household especially if you have kids. Not only that it helps your kids smell fresh even under the sun but it also prevents nappy rash and chafing. As an adult, I still enjoy using baby powder before going to sleep. It makes me feel more relaxed and fresh. I am picky when it comes to the products that we use at home. I don’t settle for affordable products that I am not 100% sure are safe to use especially on a child’s delicate skin. I only go for products that are crafted with the utmost care for the whole family. I always believe that we shouldn’t always be complacent with products that we are accustomed to use. Here in the Philippines, most baby powders (if not all) contain TALC, an ingredient that has been the subject of debate and lawsuits in the US because of its supposed link to cancer. It has yet to be proven true but it always pays to be safe than sorry. Are you willing to take chances or, are you just as careful as I am? 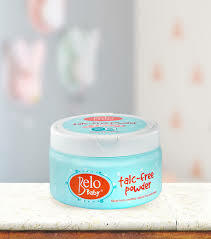 BELO BABY TALC-FREE POWDER is the answer to our dilemma of finding the perfect Baby powder. The Belo Baby Guarantee ensures you of meticulous care with its Bath & Body products having all-natural ingredients and 0% harsh chemicals. It is made from certified natural and finely milled rice and maize. It’s carefully formulated without talc, gluten, phthalates, parabens, dyes, and most common allergens. 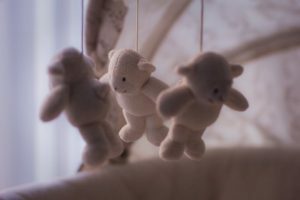 Why do I choose BELO BABY TALC-FREE powder? First off, it is always a good act to support locally made products. It comes with a very cute packaging that already includes a soft puff which makes it economical and easier to apply. 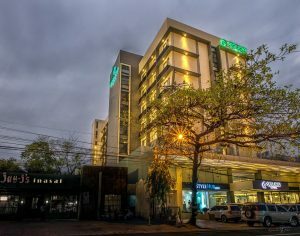 If your family loves to travel, then this could be your best friend. The scent is not too strong, so your kids can still use their favorite cologne if they prefer to. It’s crafted with care for the most delicate skin and for the most meticulous mom. We all want to have peace of mind when using a product so, it’s just right to choose only a hypoallergenic and dermatologist tested powder. I am confident with the brand because they’ve been in the Skin Care industry for a long time. Even Scarlet Belo, uses BELO BABY TALC-FREE powder. That for me is enough to trust their brand. They wouldn’t allow their precious angel to use it if it’s not safe. Are you also a fan of the super adorable Scarlet Snow Belo? Well, I bet you’ll enjoy watching her new commercial. Check it out and share away! We also want you to be able to try the product for free. Because we are feeling generous, we are giving away BELO BABY TALC-FREE POWDER to three lucky readers. It will be delivered to your doorstep all you have to do is follow the easy steps posted on our Facebook Page! Belo Baby Talc-free Powder is now available in leading supermarkets and department stores nationwide. 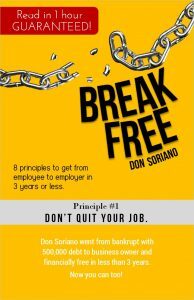 Get it for only Php219.75 (65g). What about you, what do you look for in a Baby powder? Share us your thoughts in the comments section below. Aloe Vera Gels are selling like hot cakes these days. If you’re not yet convinced why Aloe Gel should be your next best friend, allow us to share with you the benefits of keeping a tub of Coco Vera handy. As you all know, Dearberry products are Paraben free and are safe to use even in the most sensitive skin. It rejuvenates your skin and gives you extra glow. It’s non-sticky formula will make you feel fresh all day. Coco Vera is also formulated for acne prone skin and it also helps dry out blackheads and whiteheads. Don’t be afraid to apply it on your face because the smell will make you forget that it’s made from Aloe Vera! Aside from the fact that sunburn is painful, it can leave ugly marks on your skin and can triple your risk of melanoma skin cancer. You can use Coco Vera to help dissipate the heat. 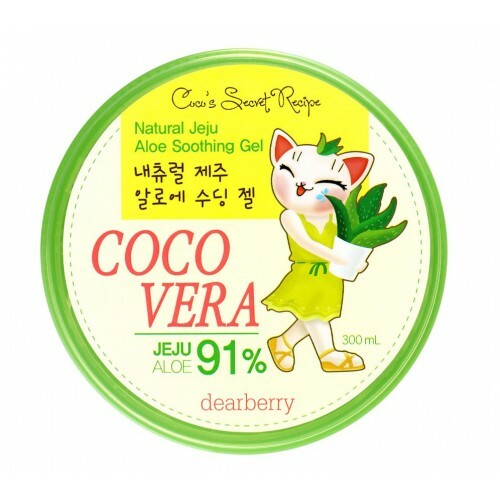 Coco Vera is made from 91% Jeju aloe and does not contain benzocaine, or lidocaine which makes it safe for sunburn. If your heels look awful when wearing open sandals or flip flops, apply a generous amount of Coco Vera to your feet before sleeping. Don’t forget to wear Socks too. Do this for at least 7 days to see improvement. Wouldn’t it be nice to show off your feet this Summer? Some hand sanitizer just leave your hands dry. Try mixing your own sanitizer. Just mix all the ingredients together or if you’re too lazy to for DIY, just mix Coco Vera with your Hand Sanitizer and voila! No more dry hands. Coco Vera is available at Shopee.ph/dearberryphilippines. This amazing product only cost Php280 per tub of 300ml. Are you the type of mom who always prepare your kid’s packed lunch and snack for school? Well, I have a good news for you. 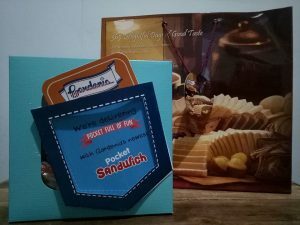 Gardenia now offers Pocket Sandwich. It’s a guaranteed healthy on the go snack so you won’t have to worry about what your kid is eating even if you’re not around. Kids regardless of their gender are always on the go, so it really helps that Gardenia Pocket Sandwich is individually packed. The product is not just handy but, it’s also packed with vitamins that your kids need. 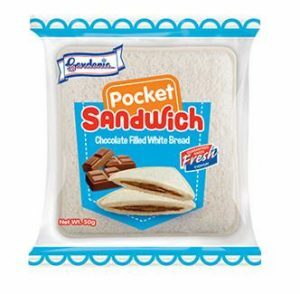 Gardenia Pocket Sandwich comes in two variants: Chocolate and Peanut Butter. 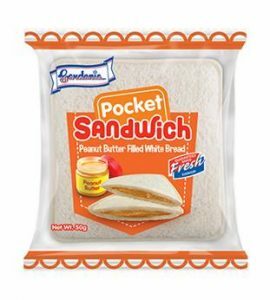 Gardenia Pocket Sandwiches are available in all leading Supermarkets (SRP Php15). Like most women, you’re probably already familiar with the concept of waxing. And like a lot of them, you probably also think that the process doesn’t sound very appealing. Still, waxing is a standard part for a lot of women’s grooming routine; and they will book a session, show up for their appointment, go through the whole (seemingly) painful procedure, and emerge smooth and hair-free, without batting an eyelid. Why do they go through it all? Because to be honest, waxing is not as excruciating as one might assume. It’s all a matter of choosing the right waxing salon to go to. 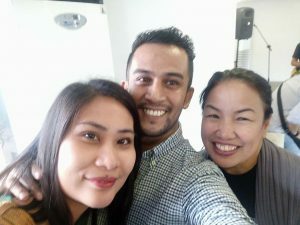 For starters, a reputable salon should be able to take you through the process without causing anxiety, regardless if you’ve been doing this for years or you’re new to the whole thing. They should be able to demonstrate why there’s no need to feel self-conscious and assure you that you’re in the hands of experts. The process is swift, and the aestheticians are trained to work in small, manageable sections and press on the skin as the wax is removed to help ease discomfort. After that, you’re ready to go. It’s all quite simple and straightforward. And if you think you’re ready to take the plunge, then there’s no better time than April 3rd—when Hey Sugar!, the country’s premiere all-natural waxing destination, celebrates National Hair Free Day. 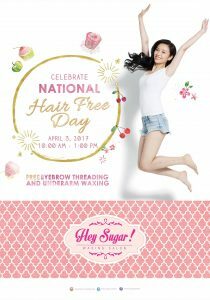 For the occasion, you can visit any Hey Sugar branch between 10:00 am – 1:00 pm and get underarm waxing and eyebrow threading for free. Summer is coming. That means hot weather, beach time, shorts, sandals, sundresses–and lots of it. The question is, are you ready? 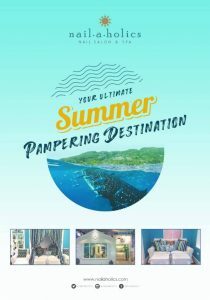 A visit to your favorite nail salon isn’t just for pre-holiday beach trips; sometimes, you need vacation from your vacation too.Summer means crowded airports, cramped flights, long road trips—and you’ll need to unwind after. Choose from our menu of spa treatments so that you not only get to relax, you also make sure you’re prepped and ready to go for your next vacation. We can’t believe that it has almost been a year since the last Presidential elections. Maybe some of you are very vocal with your Political views and may have lost friends along the way. 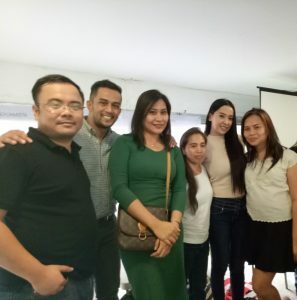 We have also lost a handful of friends when we chose to campaign for the DuCay tandem (Duterte-Cayetano). Some raised eyebrows, some unfriended us or even blocked us after seeing a series of posts on our Social Media accounts. We also got caught up in some heated arguments which we do not take personally. We have our own bets, our own biases and we respect everyone the same way that we wanted to be respected. But, we always stand up on our beliefs when needed. I (Alaine) never supported LP because I am not fully convinced with Ninoy’s heroism. One of my uncles was the one who carried his dead body at the airport along with other soldiers. They were all put to jail for more than 20 years. These soldiers along with their family members suffered for two decades for a crime who knows who committed. When the late Cory Aquino became president due to snap elections, the Aquino-Galman case was not even resolved. When Noynoy Aquino became our President, we didn’t post nasty things about him on our Social Media accounts, in fact we did a lot of research about the things that he has done and still doing as our President. I would say some are impressive. But when these issues about Yolanda Typhoon, Hacienda Luisita, Lumad Killings, and SAF44 took place, we began doubting his intentions. Didn’t he promise that we, as citizens will be his boss? We were also turned off with how he enjoyed blaming the former President Gloria Macapal-Arroyo for every negative thing that has happened to our country. When Duterte finally announced that he is running for President – just like every responsible citizen did, we researched. We asked people that we know from Davao City to make sure that the news about him are true. Miguel spent his teenage years in Taguig City sans our support for Cayetano. We couldn’t fathom how and why would a certain political party would accuse a Social media influencer or blogger a troll for voicing out his or her opinions. Quoting Atty. Darwin Cañete‘s facebook post last February 11, 2017. Have they forgotten about Freedom of Expression? 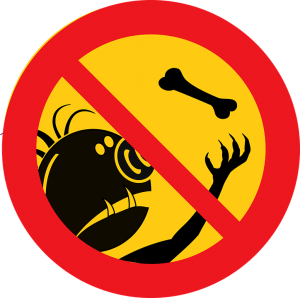 We have so much respect for bloggers like Sass Rogando Sasot, Rj Nieto of Thinking Pinoy and Mocha Uson that we didn’t let the opportunity of joining them in a live KanTalk pass us by. It was a chance for us to learn more things about the Government and our Laws since one of the guests was Atty. 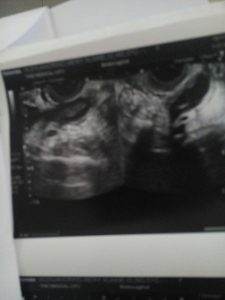 Rose Beatrix “Trixie” Cruz-Angeles. Dra. Lorraine Marie Badoy, the newly appointed DSWD Assistant Secretary also graced the event. KanTalk was the very first political event that we attended and we’re very thankful for the wisdom that were imparted to us. As Social Media influencers, they reminded us to respect other people’s freedom of expression whether or not they agree with our beliefs. Because at the end of the day, we are all Filipinos and should care for whatever is good for our country and the next generation. We were also encouraged to take a stand on issues by calling the attention of our local government officers like Mayors and Congressmen. 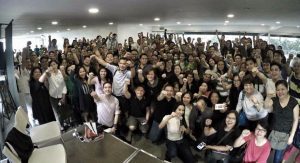 95% of the attendees were professionals – Doctors, Lawyers, Teachers and Nurses to name a few. 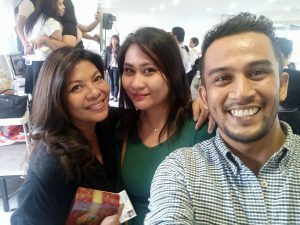 Contrary to what the other mainstream media reported, through the effort of RJ Nieto, Social Media influencers (anti or pro Duterte) can sign up to be a member of Malacañang’s Social Media Press Corps. It’s about time to prove who the real trolls are. Everyone should come out and stop hiding under the cloak of anonymity unless, they have a different intention other than making the Philippines a better country. 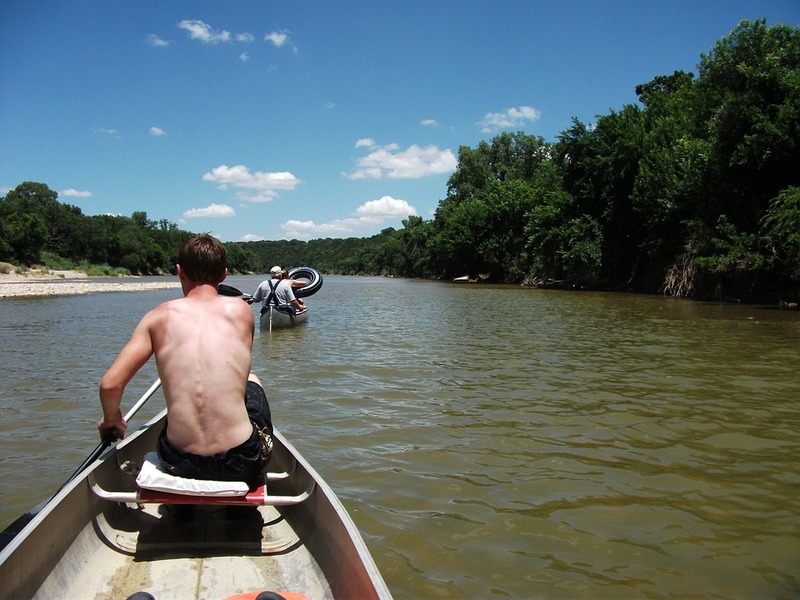 Disclaimer: Miguel and I were not compensated nor encouraged to write this post. Hey, lovely wives! Have you decided what perfume or cologne to wear this Valentine’s day? 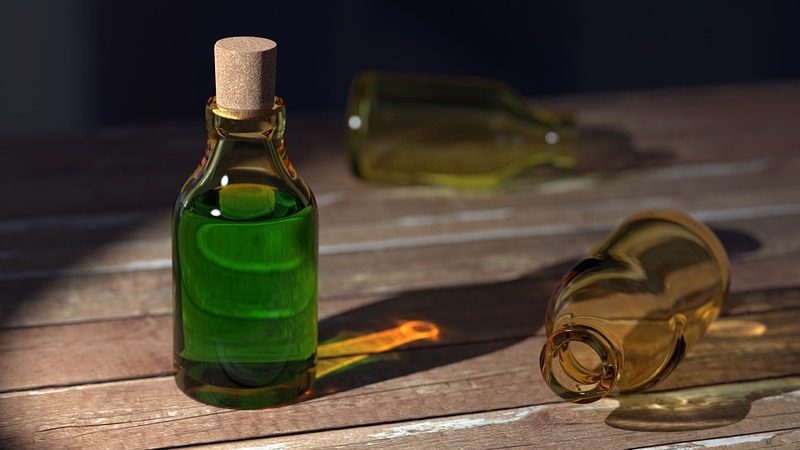 If you’re like me who prefer perfume that are not too strong, I have some recommendations for you that I am sure you and your husband will love. The scent is so delicate yet mesmerizing. Although it is quite pricey for a cologne ($130/100ml), it still is my favorite everyday scent. It’s so feminine and it smells like you just got off the shower. 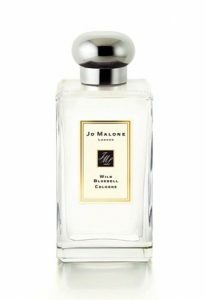 I discovered this scent when one of my friends wore this on her Wedding day. 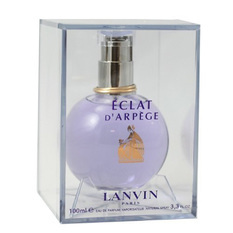 The scent is as elegant as its bottle. The scent is very warm and inviting. Your husband will definitely fall in love with you all over again. Florary and woody at the same time. Just the right smell to match a little red dress. I usually wear this scent whenever I have client meetings. That ends my Top 3 recommended Valentine’s Scents. What about you? 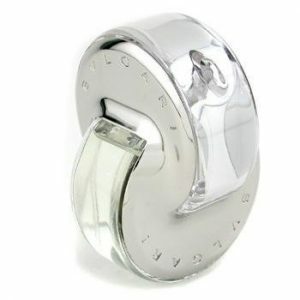 Do you still rely on the current weather to choose which scent to wear? I used to do that too before I came across these three brands. Now, I don’t have to collect too many scents and end up not using them for a long time because either the scent is too “summery” or too formal for a lunch date. These scents are so versatile and can definitely be worn on any occasions. There are some online stores selling these scents for discounted prices. 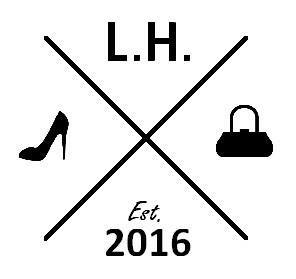 My favorite online shop so far is The Leather House PH. Order thru their Shopee account to avail free shipping fee and Cash on Delivery.